Taken on a cold winter day, this is the view from the Womens Forum outside Corbett, Oregon in the Columbia River Gorge, looking east at Crown Point and the Vista House. One of my favorite Gorge viewpoints. That's a fantastic view and beautiful shot! Stunning view of the rugged landscape softened by the misty blues. The iata House looks like a spectacular place to live. A really wonderful scene. Wishing you a Happy Ns Healthy New Year! What a beautiful view! Wonderful! Beautiful shot. Somebody had shown me pics of the Vista House but not of the vista itself. What a great view from above of the river and sky! Beautiful shot! When I used to live in Portland, I loved visiting this place, and hiking nearby. Such a beautiful location! Would be the perfect place to clear the mind. 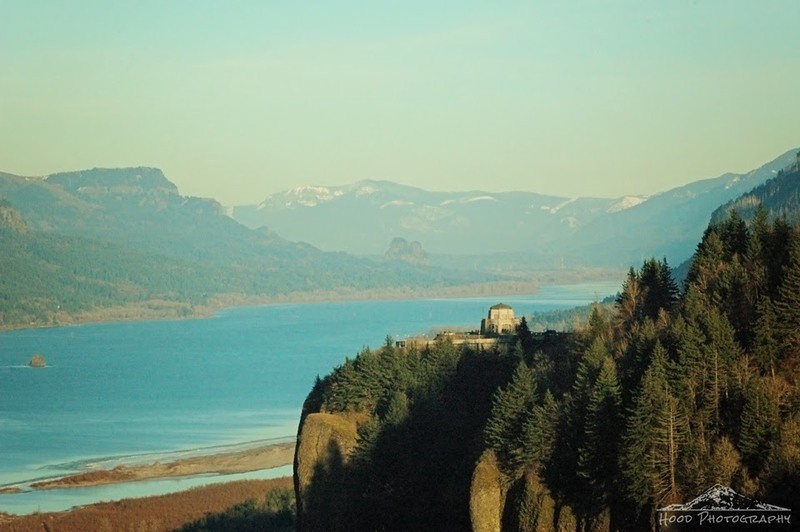 The Columbia River Gorge give so many photo opportunities. Every time I look at your blog it is like entering an art gallery. The best part about it is that it gives me so many memories of you childhood and early adult life. My Dad used to load the entire family in the car for a Sunday drive out to the Gorge. If we were really lucky we would do the entire Mount Hood loop through Hood river and back across highway 26. Have a good New Years holiday.